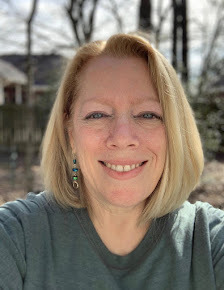 My Journey to Fit: Even Better Than I Expected! My new bike is here!!! I can't believe it got here so quickly! When I got to the bike store to pick it up, there was a small crowd around it - and all the guys working there kept calling it a "sweet ride" and yes, they are correct! 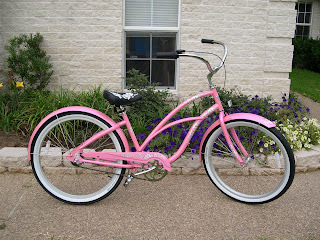 One man wants to buy the exact same bike - even in pink - for his wife for their anniversary and gave me his phone number and asked me to call him in a couple of days to tell him how it rides, etc. Too funny! I have a feeling I will not be invisible on this bike, that's for sure! 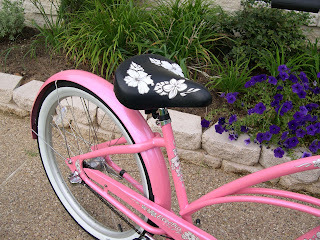 And now, without further ado, I present to you...my AWESOME BIKE!!! The seat is embossed with flowers! 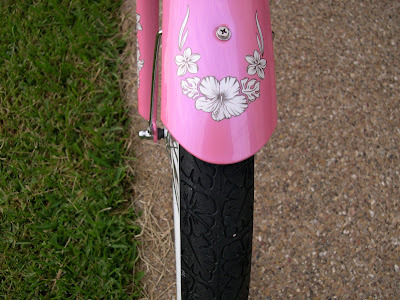 The tires are embossed with the flower design - I just about DIED when I saw this!!! I left my street tonight and rode it around my neighborhood - my horizons have expanded! I bought an odometer for the bike, but haven't installed it yet...couldn't wait to start riding! I need a name for this girl. Something Hawaiian, that's a given. I'll have to think about this. Hope you can ride when you get home from Texas Reds. This has been a week filled with many things but after today back to normal life and eating the shakes and a LC will be easier.